Many of the men and women from Essex who served in armed units are buried in the UK. Unlike active war fronts there is not a large cluster of memorials near to hospitals or bases as in most cases the families were able to arrange for the body of their relative to be returned to that persons locality for burial. The choice was then given to the relative to have a CWGC headstone, their own headstone, add to an existing headstone or have no headstone. The deaths were from soldiers badly wounded abroad and returned home for further treatment , those who were killed in training or other accidents, those who died from enemy air action or those who died from natural causes. From a total of 123,163 British Soldiers who have graves or are named on memorials in the UK , 619 were members of the Essex Regiment and 21 were members of the Essex Yeomanry who died in the UK during the Great War. Clearly from these numbers a high percentage of cemeteries in Essex contain war graves. The Commonwealth War Graves headstones criteria is explained on the War Cemeteries page but would be available to anyone who was a member of the Commonwealth armed forces and who died of illness or injury sustained during the war before August 1921 for World War One or December 1947 in relation to World War Two. Members of the armed services who died after the qualifying dates may well have their Regiment marked on their headstone but they will not have the familiar CWGC version. There are a few large military cemeteries in the UK , catering mainly for overseas personnel who died in the wars. but none of these cemeteries are in Essex. 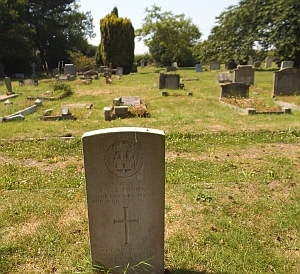 The Commonwealth War Graves website will provide the location of all graves bearing an official Headstone. Most burial grounds or churches have maps showing the location of the graves. If you have made contact with a churchwarden or council official they may be able to tell you exactly where to go. If you are visiting without prior contact there is no easy answer to finding the correct spot. Some churchyards allocate plots in strict date order, some allocate family plots together and some allocate at random. Churchyards near to barracks or in areas with a military connection may have areas set aside for military graves. Most churchyards have plots in straight rows so the safest practice is to work out which direction the rows run and then walk along the rows checking each headstone in turn until you find your headstone. NEVER rub or scrape a headstone without permission from the Parochial Church Committee and with the advice of an expert. Once a headstone has deteriorated incorrect cleaning will often destroy the information for ever. When you find your headstone don't forget to photograph it to add to your family tree details.